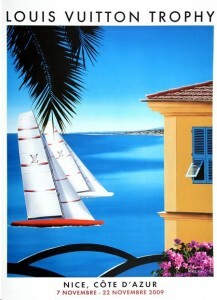 Fine poster art has modern practitioners, none more renowned than Razzia (Gerard Deneriaz). Like those great artists of old, Razzia’s works begin with a painting that is then approved by the client before moving on to the actual printing process. His client list is impressive, foremost is Louis Vuitton, whom he served since the 1990’s. Other clients include Stetson Hats, Bloomingdales, L’Oreal along with restaurants in America and Europe. 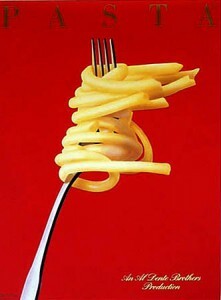 Whimsey is a key aspect of many of his works, with Pasta being the best example. Advertising the not so obvious products requires a unique look to capture the viewers eye and Razzia understands this as well as anyone. Capturing the essence of design is also a target of Razzia and his posters for the America’s Cup and the Louis Vuitton Parc de Bagatelle Classic are great examples. Here he emphasizes his vision of the sailing vessel or the automobile design from his unique perspective. His ability to add a third dimension to a two-dimensional art form empowers his image. Razzia posters are usually produced in two sizes and all are signed by the artist. Razzia lives in Paris and the South of France and is still actively producing poster art. Visit our site regularly for new acquisitions of his work.